The silversmith village of Udong lies about 40km from Phnom Penh. Udong used to be the royal capital from 1618 to 1866. 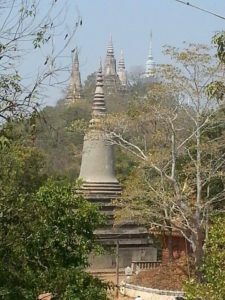 Walk the 509 stairs up to Phnom Udong for spectacular views over the countryside with its many sugar palm trees and explore Udong’s temples, stupas and shrines. Oudong was founded by King Srei Soryapor in 1601, after the abandonment of Longvek. Under the reign of King Ang Duong (1841-1850), he constructed canals, terraces, bridges and erected hundreds of pagodas in this region. Oudong was later abandoned by King Norodom in 1866 in favor of Phnom Penh. From 1618 until 1866 it was formally called Oudong Meanchey, home to a succession of kings deposed from the former capital of Lovek by the invading Thais. 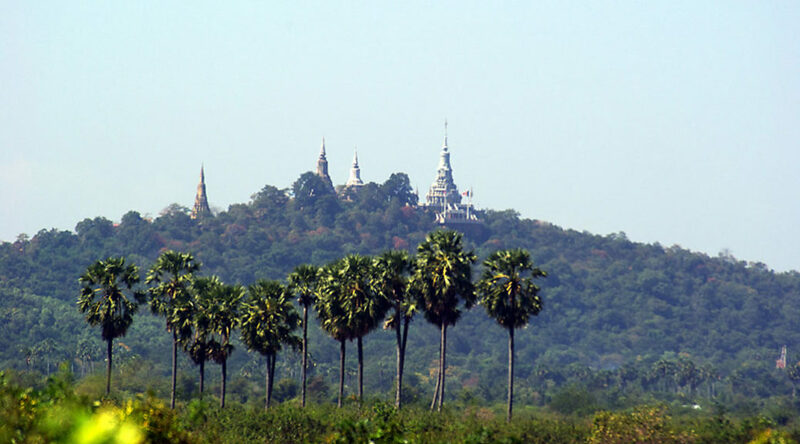 In 1866, it was abandoned by King Norodom, taking his royal court along with him to the current capital, Phnom Penh. It was extensively damaged by the Khmer Rouge in 1977, along with the other temples, monuments, and religious structures there.